Some members of the Newman Center at the University of Pennsylvania pose on the Penn campus. College is a time of change and transformation. It is also a time when many students rediscover and deepen their faith. Pam Putnam came to the University of Pennsylvania from Crescent City, Nevada. She found herself stressed and at times overwhelmed by the pressures of college life. “I had a pretty difficult semester. It felt like things were out of whack for me,” Putnam said. Then, during the fall of her junior year, she made a retreat at the Penn Newman Center. That marked a turning point for Putnam. For students dealing with the trials of the university experience, the Newman Center can be a safe harbor. The Penn Newman Center, directed by Father James McGuinn and Jeff Klein, offers weekly events to bring the community together. During her senior year Putnam sought out something that could act as an extension of her time at the Newman Center. Since high school she had wanted to take a year off to do volunteer service. Klein pointed her to the Jesuit Volunteer Corps (JVC), an organization of lay volunteers who live in small communities across the country and internationally. The volunteers – known as JVs — work with poor and marginalized people in their community. Putnam was accepted into the JVC and placed with theSt. Joseph the Worker program inPhoenix,Arizona. There she works with the homeless to disadvantaged, helping them find work. 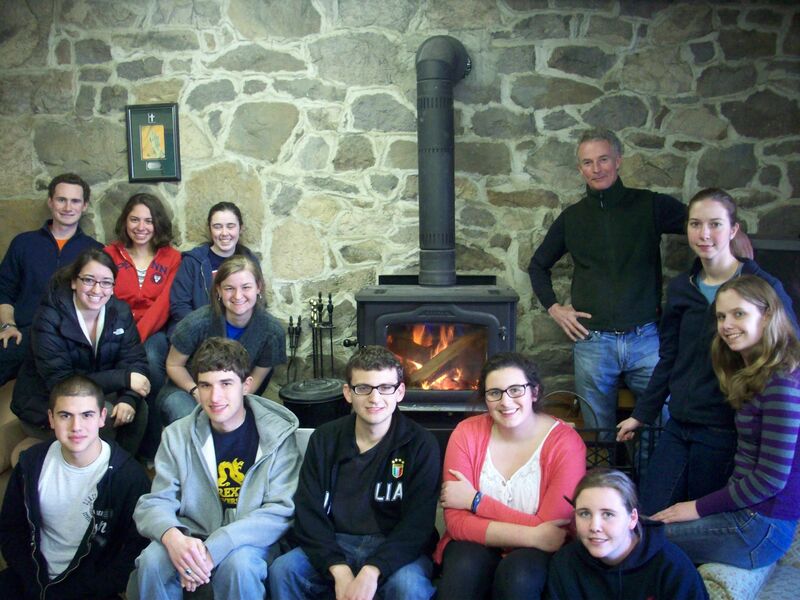 Father James T. McGuinn (back row right), chaplain of the Penn Newman Center, spends time with Penn students at the center last winter. A hallmark of Jesuit teaching is seeing God in all things. Putnam tells how an experience atSt. Joseph the Worker brought that idea into her life. “We have a sign-in sheet at the front desk,” she recalls. “One day I was working at the desk and I noticed a client had signed in simply as Jesús. And I’m looking at this and I realize, well really, Jesus is in all of these clients. The JVC experience has been incredibly rewarding for Putnam and the political science major is considering coming back toPhiladelphia to do social work. She encourages every college student to do service.